Sunday, April 22 at 7:30 pm. Tickets are $25 plus fee. A world-class soloist, accomplished composer, and formidable bandleader, Grammy Award winning saxophonist Chris Potter has emerged as a leading light of his generation. 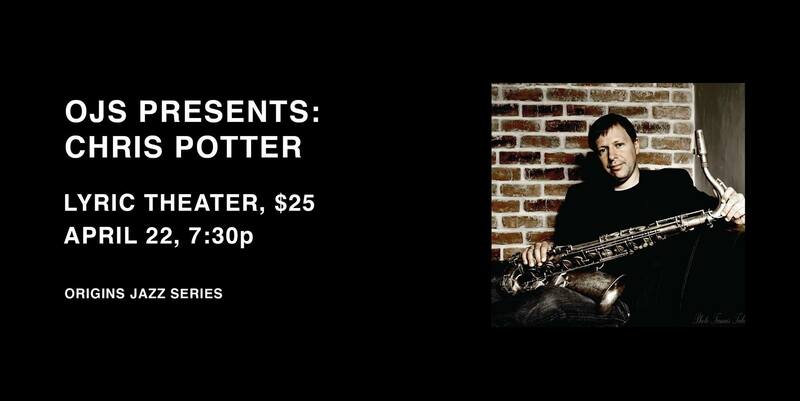 Potter’s music showcases limitless creativity and a vibrant sense of swing, prompting critics, musicians, and fans alike to cite him as the one of the finest saxophonists today. Throughout his career, Potter has performed and recorded with artists as diverse as Steely Dan and Herbie Hancock, and has toured the world over with the Dave Holland Quintet, the Overtone Quartet, AZIZA, and the jazz-funk group, Chris Potter’s Underground. The Dreamer is the Dream, by the Chris Potter Quartet, is the current chapter in Potter’s storied career.